There is a phrase among fast hikers "10 by 10" meaning you've hiked 10 miles by 10am. I've never been faster than 11 by 11 before but this morning I got pretty close with a 9 by10. For some reason I felt the urge to get to town and get washed up. In addition I'm in serious need of a hat because of the sun, and the mosquitos which have made quite a meal of the blood from my head over the last 24-36 hours. Blisters and oozing. TMI? Anyway my alarm went off at 4:30 this morning but I was already awake. Awake and ready to tackle the climb up and out of the river canyon. Here's what the bridge looked like when I took off at 5:15.
when I was buzzed, really loudly and close to my head, by some kind of bird. It was a kind of screeching, whizzing by kind of sound that seemed almost mechanical. Something I've never heard before for sure. It scared the bejessus out of me and I stood there watching it swoop around me in tight circles. I finally started walking away but with my hiking poles over my head, waving them back and forth. Finally after about 5 minutes the creature stopped following me. It seems I must have disturbed its morning coffee or something. 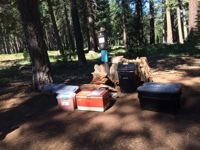 The rest of the morning hiking was uneventful and I arrived at the trail head only to see some trail magic in the form of ice boxes and a gear box. I got a soda but it was too sweet for that early in the morning. Looking at all the trail angels listed I texted "Pipers Mom" who is a local helper, but at the same time the wife of a guy I had just met, pulled up to take him off the trail for a few days. They offered to take me to Chester and they dropped me off at the Best Western at 11am. I don't remember his wife's name but he is Mr. Burns. He hopes to finish the trail this season. My room has a deep, deep tub, which I took full advantage of, and then I washed my clothes at the local laundry, two doors down. Details and town chores... But then I saw this. Makes me want to head right back out into the woods.